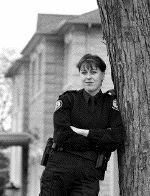 Constable Joanna Theriault once watched a thief try to break into her own house while she was on plainclothes duty. My home was broken into recently while I was out of town. It happened around 6 a.m., according to my early-to-rise neighbour, who was out for a morning jog. He saw a red compact pull up to my house and a young man get out. They greeted each other, and my neighbour went on his way. A few minutes later, the police were swarming my place, after the alarm did what it was supposed to do. "He was a friendly robber," said my neighbour, consolingly. The area where I live -- around Bayview and York Mills -- is being taken over by burglars. One woman on my street told me robbers broke in to her house, ignored the alarm, ran to her bedroom closet, stole her jewellery and were gone by the time the police arrived. Really, imagine keeping your jewellery in the bedroom. I thought everyone kept their baubles in the fridge, which shows what a lousy crook I'd make. "Break and enters are becoming quite common," says Constable Joanna Theriault, a crime prevention officer at 33 Division. "We're very concerned about the increase in these occurrences. The robbers aren't harming people, just looting, and most of the break-ins are, surprisingly, during daytime." I'm spooked. I sleep with my hammer in one hand and my cellphone in the other. Of course, as the Const. Theriault points out, "If you have the latest security system, a message goes straight to the police if your phone line is cut." Const. Theriault says it's not just my neighbourhood either. It's happening everywhere, though the northern reaches of Toronto, south of Hwy. 401, seems to be particularly vulnerable. And no one seems immune. "Once, when I was working plainclothes, we were following a suspect. We watched from the car as he made his way suspiciously through a neighbourhood. He ended up walking to the street that I live on. I watched as he went through the backyards and ended up at my house. He tried to break in. I couldn't believe it." Fortunately, he wasn't able to break in because Const. Theriault had her windows nailed shut (don't ask, she's a police officer, remember). Officers I've talked to have all sorts of tales to tell. Recently, for example, some hoods tried to break into a local convenience store. They took great pains to throw large garbage cans through the upper part of a plate-glass window, then gingerly hoisted themselves up and dove through the broken glass. The store was open, and by the time they landed inside the clerk had long since called the police and they were immediately apprehended. Others are wilier. Police showed up at one house, confident they were in time to nab a repeat offender. Since they considered him a pro they called in the big guns -- the swat team. The officers went through the house, guns in hand, but it appeared the robber had alluded them. I was told the officer in charge of the investigation sat down in the kitchen, discouraged, head in hands. Out of the corner of his eye, he saw a suitcase in the hallway move. Upon further investigation, he found the culprit, a modern-day Houdini, hidden inside. The officer sent home for his videocamera and asked the crook if he would mind getting in and out of the suitcase a few times so he could record it. "Otherwise no one at the station will believe me," he said. The crook was more than happy to oblige. In another case, a burglar was found hiding behind drywall, and was equally proud of his ingenuity. Const. Theriault says that if you want to give your friendly neighbourhood robbers a run for your money there are a few things you can do. First, be suspicious of anyone carrying anything of value from a neighbour's home. But surely that's obvious, I say. "You'd be surprised," she says. "People don't report." Also, she says, "be on the lookout for anyone looking into neighbour's windows, people climbing over fences or strangers driving slowly through a neighbourhood following an aimless or repetitive course." Second, don't answer the door. Be especially suspicious of anyone who comes to your door saying they're looking for a friend who supposedly lives there, which is a common ruse. If a stranger knocks on your door, yell through the door that you're home but can't come to the door. "The bad guys might be knocking just to see if the house is empty," says Const. Theriault. Third, check out people who are loitering or seem out of place. Remember, culprits aren't just youngsters. Remember, too, that burglars are creatures of habit and sometimes go back to a house they've robbed and break the same back window. "The bottom line is people are seeing things and they're not calling us," she says. "Call us if you see anything suspicious." If you hear someone break into your home and you can't get out safely, hide in a closet. If you're fortunate enough to have your cellphone, call 911. Remember that your home phone line might get cut. And whatever you do, "Don't be a hero. Do not confront." "No fear of that," I assure her. So the crooks don't want to hurt us, but what about the family I heard about whose recent break-in netted the bad guys about $200,000 worth of merchandise. They took just about everything -- cash, jewellery, credit cards, televisions, VCRs, computers, car keys and the car itself. "And they're carrying the stuff out the door in broad daylight," says Const. Theriault. A case in point, she says, is the witness who told the police he saw a man carrying a TV set. "I did think it was a little suspicious," he said later. But he did nothing. I remember a similar case, years ago, when I worked at the CBC studios on Jarvis Street. A group of men came in and carried away the grand piano in Studio 7. No one questioned them. "They looked like they knew what they were doing," said one witness. Const. Theriault has one more piece of advice. "If all else fails, get a dog. Dogs are unpredictable, even small dogs," and thieves go to lengths to avoid them. "I've never attended a B&E when there was a dog in the house." The officer ends by saying, "People find it devastating after they've been broken, especially older people, who can't sleep after a B&E." So here I am back in bed with my hammer, my cellphone and Fido, er, Fido, where are you?